Hit the Slime-filled race tracks with Nickelodeon Kart Racers! 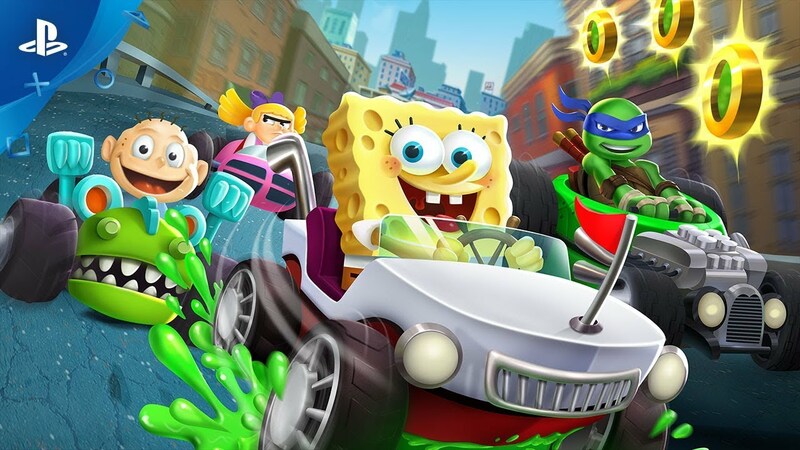 Select a racer from one of your favorite Nickelodeon series, including SpongeBob, Patrick, and Sandy from SpongeBob SquarePants; Leonardo, Raphael, Michelangelo, and Donatello from Teenage Mutant Ninja Turtles; Arnold and Helga from Hey Arnold! ; and Angelica, Tommy and Reptar from Rugrats. Race your friends in up to 4-player local multiplayer or check out the Battle Arena for a variety of challenges. Choose from 12 of the most iconic Nickelodeon characters: SpongeBob, TMNT, Hey Arnold!, Rugrats and MORE!!! Awesome Co-Op and Local Multiplayer for non-stop action the entire family will love!! ©2018 Viacom International Inc. All Rights Reserved. Nickelodeon, Hey Arnold, Rugrats, SpongeBob SquarePants, Teenage Mutant Ninja Turtles and all related titles, logos and characters are trademarks of Viacom International Inc. Hey Arnold created by Craig Bartlett. Rugrats created by Klasky Csupo. SpongeBob SquarePants created by Stephen Hillenburg. ©2018 GameMill Entertainment, LLC. All rights reserved. GameMill Entertainment is a registered trademark of GameMill Entertainment, LLC.